There are so many great events over the next couple weeks, I just wish I could be in more places at once. With the over load of events over the next couple weekends I have decided to do an expanded edition of TEN to more like fifteen. 1. 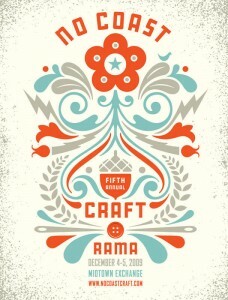 No Coast Craft-o-Rama began in 2005 as an event for local designers, artists, crafters and other talented creators of unique handmade goods to sell and showcase their products. Like the Local Food movement, contemporary craft has figured out how to market their work and expand an audience….and do it very, very well. This year’s event is this weekend-December 4th (3 p.m. to 8 p.m.) and 5th (9 a.m. to 5 p.m.) at the Midtown Global Exchange building. This is one of the hippest events of the year. For a full list of vendors to check click here. 2. 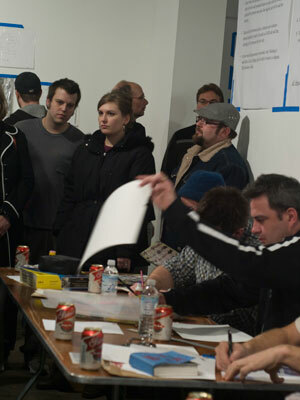 Second Annual Monster Drawing Rally: Saturday, December 12 is Midway Contemporary’s Second Annual Monster Drawing Rally, a benefit event involving over 75 local artists. Midway’s three galleries will be cleared to hold a series of tables where participating artists will draw live in front of attendees. Upon completion, each drawing will be hung on the wall and available for purchase (first come, first serve) for a flat price of $35. All proceeds will directly benefit upcoming programming and educational opportunities at Midway. The event provides the rare opportunity to watch artists work and purchase original artwork at discount prices. Unlike many fundraisers, filled with expensive auction items, beyond the budget of most attendees, the Monster Drawing Rally offers an opportunity for art patrons of all income levels to support the institution and take home an original work of art. I can tell you from direct experience last year (as one of the participating artists…and I will be doing it again this year) that it was a crazy event and one of the best times I have ever had in the local art community. Even though I was surprisingly anxious drawing in front of so many people. But when you see someone eagerly follow your piece to the wall to purchase it..that is pretty special. The energy in the room is buzzing and everyone is just having a great time. Not to be missed. This event is free and open to the public. Full list of artists is listed below. Note: The idea for the Monster Drawing Rally originated with Southern Exposure in San Francisco. 3. WAMPLIFIED: Mates of State at the Weisman: So after the Monster Drawing Rally head over to the Weisman for the Inaugural installment of WAMplified!, a new late-night series at the Weisman Art Museum which bundles together live music, food, drinks, a video game lounge and midnight gallery tour. The events starts at 9pm and features a concert by indie rock/huband/wife duo Mates of State. Followed by a Midnight tour of the galleries with curator Diane Mullin and artist Lisa Bradley. Tickets to the event are $22 for the general public and $18 for Weisman members and students. Doors are at 9 p.m. To purchase tickets, visit weisman.umn.edu or call 612-624-2345. The cost of admission also includes two free drink tickets and free food throughout the evening. The opening act is Minneapolis-based Anders Ponders. Here is a video of the Mates of State covering Phantom Planet’s “California”. Gotta love the OC theme song cover. 4. Local Artist Gift Mart at the Walker Art Center: Even more opportunities to find great local art gifts. 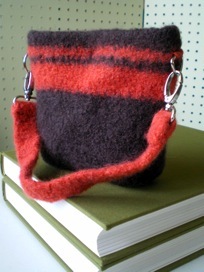 The Walker Art Center is hosting a local artist gift mart this upcoming weekend, Friday through Sunday, December 4-6. It’s open from 12 noon to 4 pm in Target Gallery.Its a very hip lineup of local artists over felted handbags, jewelry, wooden bike handlebars, t-shirts and I am sure a wealth of other surprises. Brian Aldrich, Saman Bemel Benrud (Minty Fresh Monster), Adam Brackney (Workerman), Yen Chee, Kelsey Ciatti-Miller (TillyLula); John Danicic, Gia Gifford, Paul Hempe and Chad Campbell (ZerOw Bags), Michele Heidel (Fennel Studio), Raighne & Meghan Hogan (2D Cloud), Helen Jerlach (Numsi Design), Josh Journey-Heinz, Lisa Larson (The Green Squirrel), Keith Moore (Pilot Design), Sarah Nassif (Rectangle Design), Peter J. O’Toole, Lacy Prpic-Hedtke, Jill Smith, Molly Spilane, Caitlin Wicker (Sweater Toys), and Ashley Wokasch & Luci Kandler (Calpurnia Peach). This also coincides with Member Double-Discount Shopping Days at the Walker and along with numerous other events throughout the weekend. 5. MNfashion welcomes Jay Arbetman of Chicago for their first Open Studio industry event and MNfashion Membership Drive Friday, December 4th from 6-9pm. Individual 30-minute appointments for Saturday, December 5th between 10am and 6pm can be made by contacting info@mnfashion.org. While you are at it check out all of their resources for local designers at their site. 6. Erik Friedlander: Block Ice & Propane at the Walker: In Block Ice & Propane new compositions are paired with family and “road cycle” images created by his father, celebrated photographer Lee Friedlander, and mother Maria Friedlander, films by Bill Morrison, and engaging short tales about the kind of travels familiar to so many of us. Taking inspiration from American roots music, Friedlander executes extraordinary finger-picking technique and reverberant tunings, creating a fresh form of American cello music that is lyrical, plainspoken, and emotional. $13 Student Tix Still Available too! 7. Robot Love: Out of gift ideas…this will fix your problems and most likely start a personal addiction as well. 8. CVA Annual Holiday Art Sale: Mark your calendar for yet another student and faculty art sale. CVA’s newly expanded Holiday Art Sale December 5 and 6. This year’s sale promises to be ripe with fresh artwork for you to peruse and purchase. Your best bet at snatching up the hottest artwork is to attend the Preview Party on Friday, December 4. Preview tickets are $20 purchased in advance online, or $25 at the door. The sale features artwork by students, alumni, faculty, and staff. Selected sale artwork and prints from the CVA Art Archives will be included in a silent auction. The auction closes at 3 p.m. on Sunday. Proceeds benefit CVA scholarship funds. 9. ffffound: I love this site…..you will too. 10. Art Hounds: is a weekly program featuring three people from the Minnesota arts community talking briefly about a performance, openings, or event they’re excited to see or want others to check out. The programs organized and coordinated by Chris Roberts and Molly Bloom is a wonderful set of tips and hints from within the art community. Check the site for opportunities for you to become a “hound” yourself. 11. Ruben Nusz is an artist and writer for mnartists.org. Ruben always has a fresh, unique and engaging take on every topic on which he writes. His most recent essay is about The Louvre and the Masterpiece exhibition, now on view at the Minneapolis Institute of Arts, and the recent Spike Jonze adaptation of Maurice Sendak’s 338-word source material, Where the Wild Things Are. 13. Springboard for the Arts is hosting a FREE Seasonal Flu Shot Clinic for Artists this Sat, December 5 from 9:00 am – 10:30am at Doctor Sam’s office (1300 Quincy Street NE, Suite 100, Minneapolis, MN 55413). To register, PLEASE EMAIL your name, address, phone number and artistic discipline to nikki@springboardforthearts.org. Thank you to both Springboard and Dr. Sam for making this opportunity available. 14. Recession Hits Artists Hard. A major new survey of American artists is out asking how they are weathering the economic downturn. The survey found that slightly more than half of the artists polled experienced a drop in income from 2008 to 2009, a blow to an already struggling group, two thirds of whose members reported that they earned less than $40,000 last year.